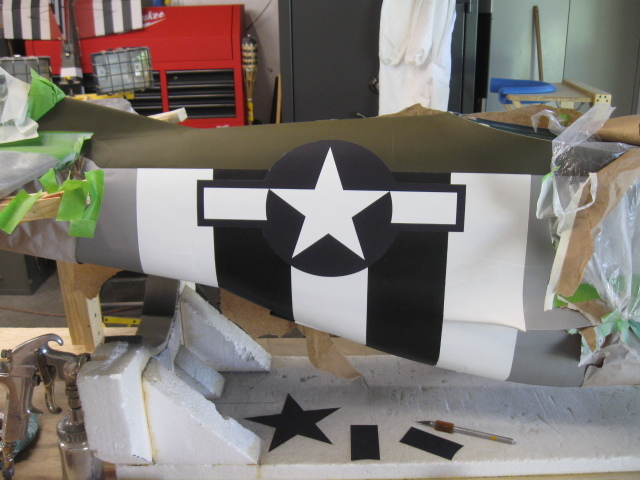 Last week, Lane Crabtree gave us an overview of his CARF Models P-51 painting project and detailed how he primed the aircraft and painted the silver and olive drab layers. 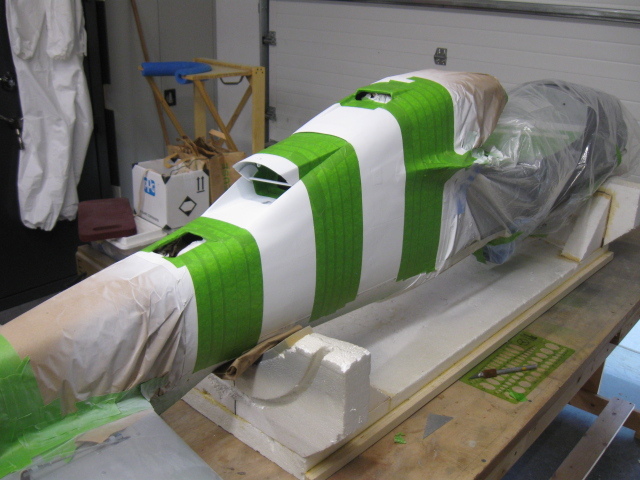 This week, he begins by masking the canopy. The canopy is one thing you cannot afford to mess up, so mask it carefully. 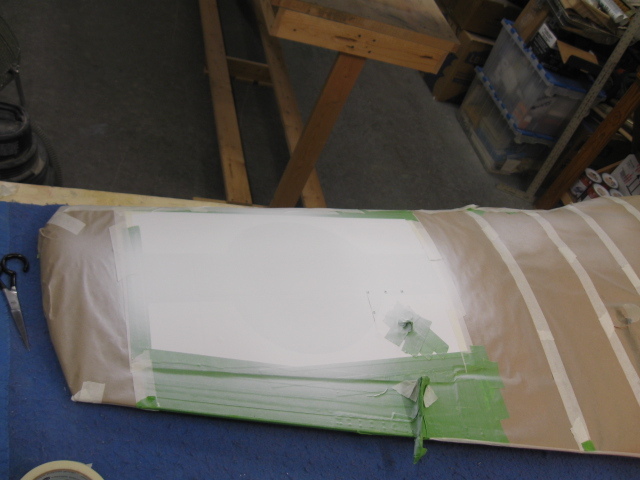 I used the fuselage as a resting place to do the masking. The canopy frame needs silver at the front only, but I painted the entire frame with silver as a primer. 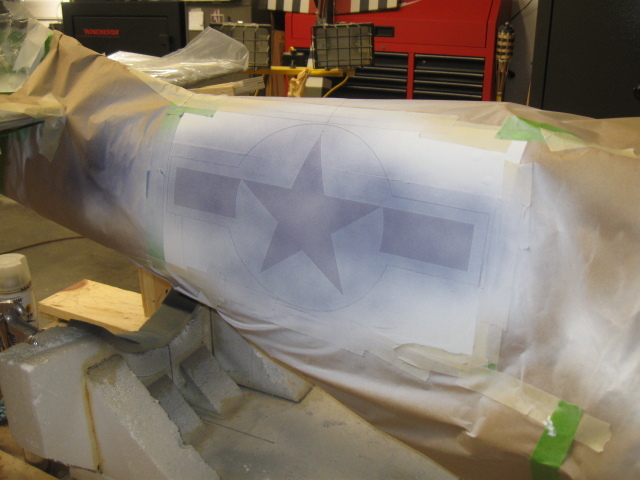 The front canopy frame stays silver so it needs to be masked off after drying, but the lower frame gets OD Shade 41. 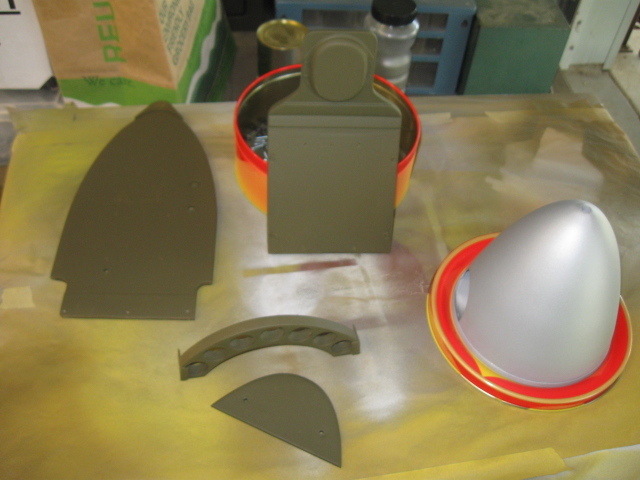 Several light coats as before until it covers well. While you have one color in the gun, go ahead and paint other small parts at the same time. Saves cleaning the paint gun one more time. This particular P-51D had silver canopy frames and OD Shade 41 as well. I kept the proper paint where I could. The more authentic details you add, the more interesting the model becomes. 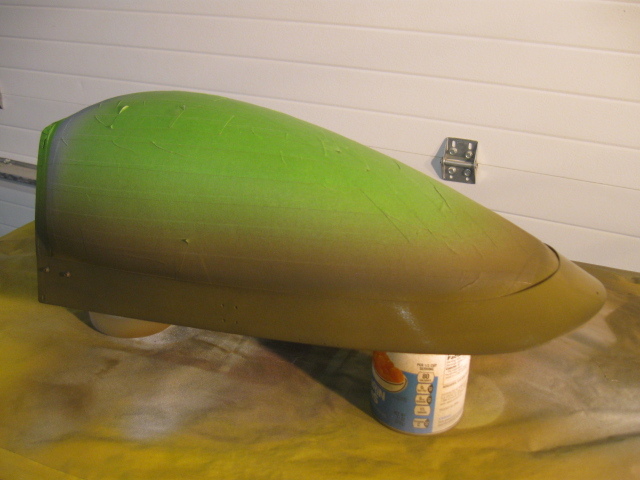 Once you get the two basic colors on the fuselage, time to begin to add some invasion stripes. They will be stark black and white (no Mil Spec colors) alternating stripes behind the cockpit and later on the wing bottom. I recommend using 1” Green Frog tape for the masking as it held a VERY TIGHT CLEAN edge. 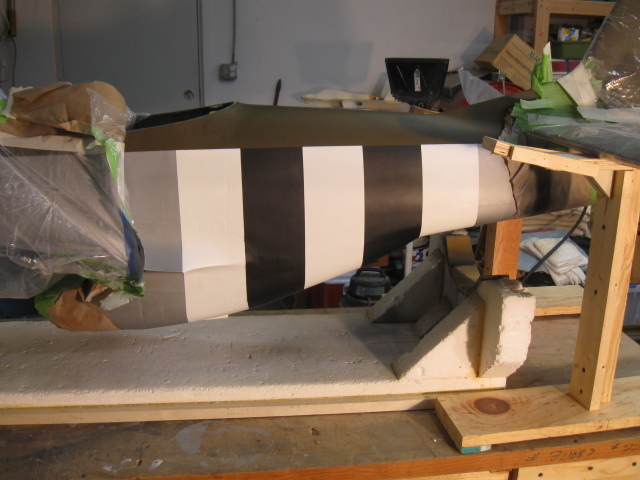 The stripes are a two part process; first paint white all across, then add the black stripes. Part of the fun (or misery) of painting is deciding where things fit on the paint scheme. Most of what I do is “eyeballing” along with some measuring. 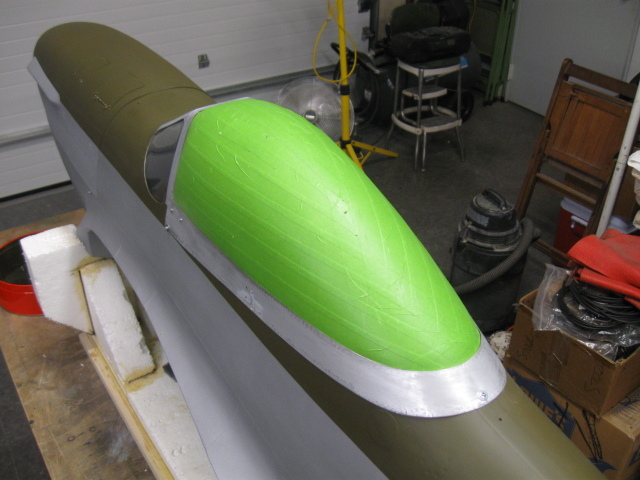 Here, I have determined that the stripes begin at the OD Shade 41 paint line and extend around the fuselage to the other side. Pick one side and go at it. The entire area here will be white latex. Use old parts-bags that come with ARF’s to mask off large areas as shown here. Saves a lot of masking paper. But, don’t use newspapers for masking as the ink will come off on your hands, and then to the model. But however you do it, make sure you have covered all the OD and silver paint. The important thing here is to make the lines perfectly VERTICAL. Not as easy as it sounds, especially going around to the bottom of the fuselage. It also helps to block the fuselage up as close to level as possible to give a better eyeball perspective. 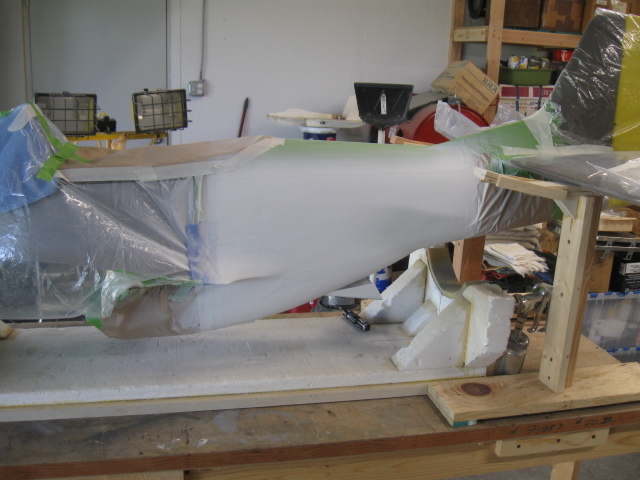 I’ve set the tail on custom stands to level the fuselage and to clear the foam cradle. Several coats of white have been done. Let this side dry while working the other side. Keep it going to both sides and bottom. Stuff tissue or paper into any openings to keep overspray out. Mask off for the black stripes. Again, make sure your lines are vertical and well sealed at the edges of the tape. Going around the curves is the hardest part to get correct. I tape-on kevlar fishing line to go around the curves as a guide and then lightly pencil-trace them when it looks right. Try to visualize cutting the fuselage in two on a table saw, that’s how the lines should look on the curves – perfectly straight. Black paint covers pretty easy, but still takes a few light coats. Making progress! All edges are sharp and clean. Especially the transition between the OD and stripes. The first Star and Bar paint mask is in position. This requires some measuring to make sure the S&B is parallel to the paint separation line between the OD and silver. 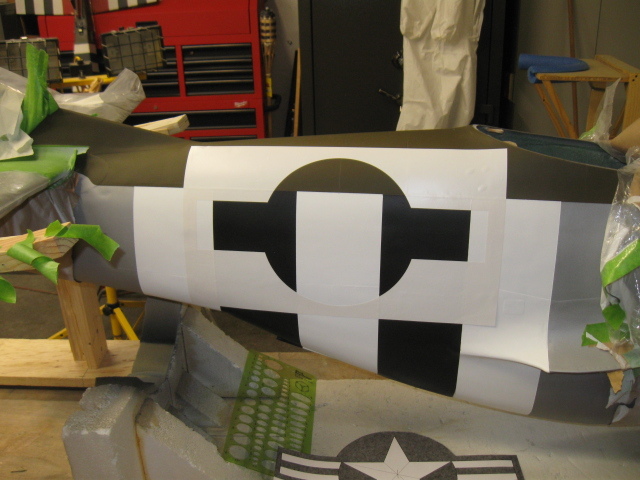 The S&B goes in the center of the invasion stripes and slightly above the paint line. Mask off all areas of the fuselage. 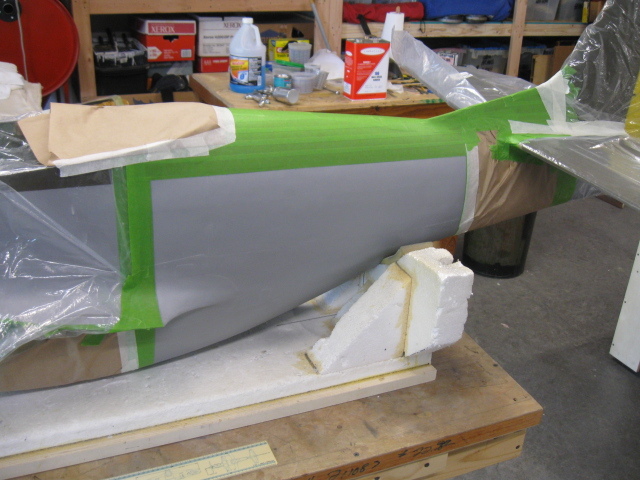 I missed a photo of this step on the fuselage, so I’ll substitute the one from the wing S&B. Mask gets painted white inside. Make sure it covers all the OD Shade 41 and black invasion stripes. 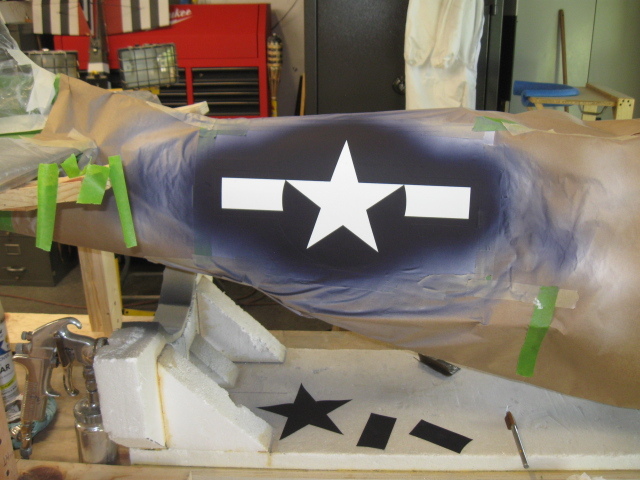 After the white is dry, add the 2nd paint masks (star and 2 bars) to cover the white areas. Make sure all the masks are centered and sealed tight. Note the pencil marks on the paint mask. It helps to mark the dead center of each paint mask before you apply them as you can gage where the star goes; dead center. Then spray with Insignia Blue Mil Spec FS 35044. Use light coats here to keep any wet spots from around the edges as they may bleed through the masks. CAREFULLY remove the inner S&B paint masks to reveal the stark white areas and you are done. And then CAREFULLY pull off the outer paint mask. Now you have a great looking S&B that will stay in place, won’t bubble under the heat of the Sun, and looks like the real deal. Process is the same for all S&B’s on the aircraft. 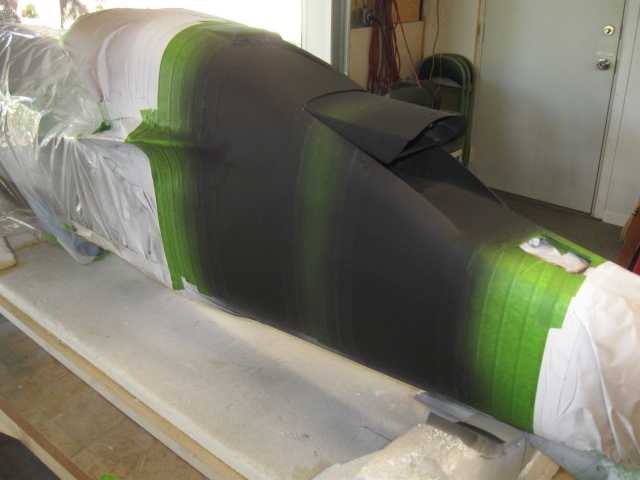 Stay tuned for next week, when Lane adds the Squadon alpha-numerics next to the S&B and the checkerboard pattern on the front of the fuselage. As an aid to getting true horizontal and vertical lines, make use of a laser level, similar to those used by ceramic tile layers, as the lines are fine and can be transferred with a series of short pencil marks, the draw in by joining the dots. 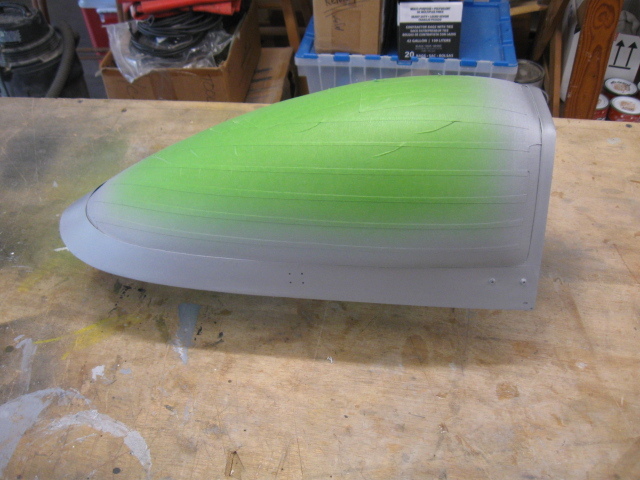 The laser can be used to set up all the frames in the fuselage construction as well. 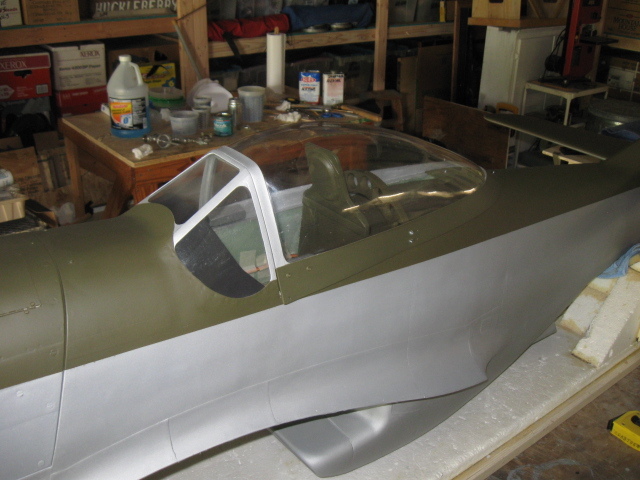 Thanks for the article…I love to see how other modelers tackle scale details. Hi Jim, nope, I sprayed right on top of the OD paint. Covered fine. But, you can very carefully “wipe” a 3M scotch Brite pad over the OD area just before you paint over it. 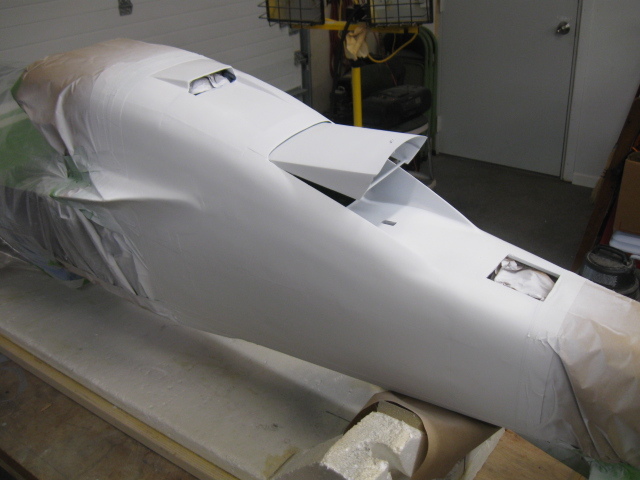 In fact, if you plan to use a flat clear coat on the entire model, you can lightly wipe it down overall with a Scotch Brite before you apply any paint masks. This will remove any overspray or rough spots on the latex paint which will make the paint masks have a much better “seal.” Just make sure to use an air hose or cloth to clean those areas after using the Scotch Brite pads. Any slight scuff marks will usually disappear after applying a cleat coat. I like to use a clear coat on the entire model as it evens up all the paint areas and gives a uniform appearance. But, when using latex paints, might be a good idea to give it time to “really” dry before adding the clear coat – maybe a week or two. Manne, I looked for my laser level and couldn’t find it! ha. It’s in the shop somewhere. Haven’t seen it in quite a while. Great idea though.